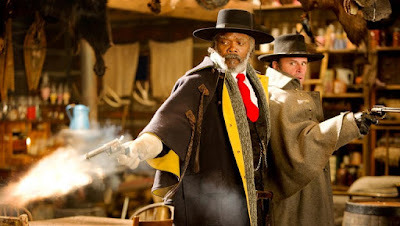 While racing toward the town of Red Rock in post-Civil War Wyoming, bounty hunter John "The Hangman" Ruth (Kurt Russell) and his fugitive prisoner (Jennifer Jason Leigh) encounter another bounty hunter (Samuel L. Jackson) and a man who claims to be a sheriff. Hoping to find shelter from a blizzard, the group travels to a stagecoach stopover located on a mountain pass. Greeted there by four strangers, the eight travelers soon learn that they may not make it to their destination after all. Tarantino is one of the best filmmakers of his generation. The man knows how to write a compelling story and shoot it in a way that you know from the opening reel it's a Tarantino picture; he is an auteur. The Hateful Eight is a western unlike any before, it has the feel of a classic Serigo Leone film but a sense of dread that can only be likened to John Carpenters The Thing. The cast is outstanding and should have taken home more than just the Oscar for Best Score. Both Jennifer Jason Leigh and Walton Goggins deliver performances that should have easily secured them Best Supporting Actor awards (only Leigh managed to get nominated). The cinematography is a thing of beauty, Tarantino's decision to shoot in 70mm fills each frame with so much visual information you need more than one viewing to drink it all in. The film is almost perfect, but hits a small snag when Tarantino decides to hold the audience's hand and walk them through the chapter "Domergue has a secret". He does this by narrating the story and pointing out exactly what is happening instead of showing it a way where the viewer can connect the dots on their own. The Hateful Eight may hit a snag but the the overall product is still amazing and worth watching every second of its 180 minute runtime. If you are a Tarantino, Western, Horror or Kurt Russell fan then you have no reason not to see this movie.